High Desert Pure craft CO2NCENTRATE should be enjoyed with a good delivery system that doesn’t leak, clog or alter the flavor of the product. 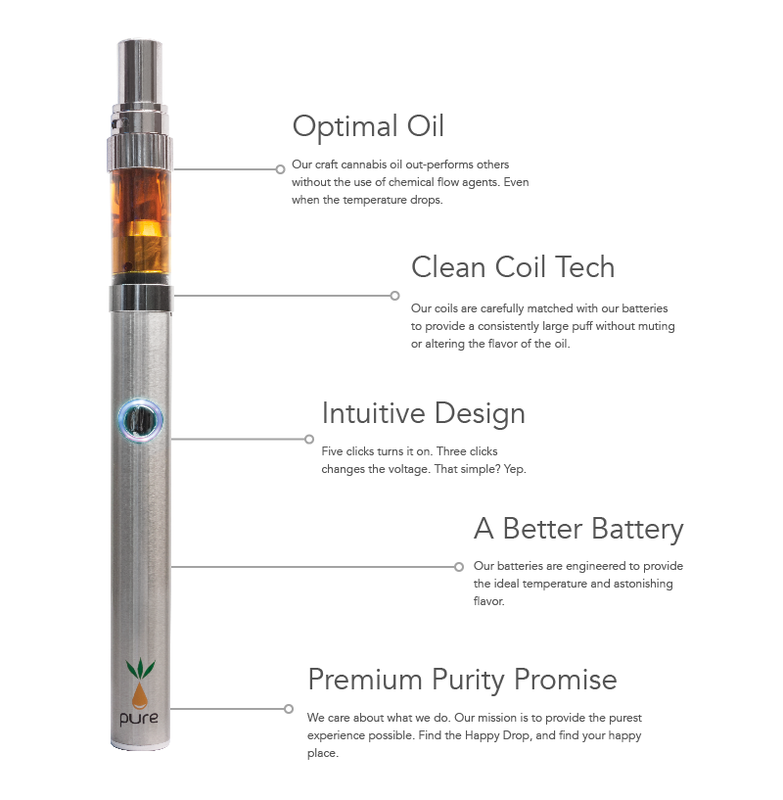 The High Desert Pure Pen™ ensures you’ll hit your Happy Place every time with a clean burn and reliable coils. Each pen is prefilled with 0.5 ml of strain-specific craft CO2NCENTRATE. Our craft cannabis oil out-performs others without the use of chemical flow agents. Even when the temperature drops. Our coils are carefully matched with our batteries to provide a consistently large puff without muting or altering the flavor of the oil. Five clicks turns it on. Three clicks changes the voltage. That simple? Yep. Our batteries are engineered to provide the ideal temperature and astonishing flavor. We care about what we do. Our mission is to provide the purest experience possible. Find the Happy Drop, and find your happy place. Questions? We've got your back. What should I do with the rubber cap? For starters, take it off. After that, my friend, it’s up to you. Keep it on the top of the atomizer to keep away treacherous pocket lint. Use it in your trendy homemade jewelry. Fashion it into a stylish hat for your hedgehog. The world is your oyster. How do I attach the Atomizer to the battery? 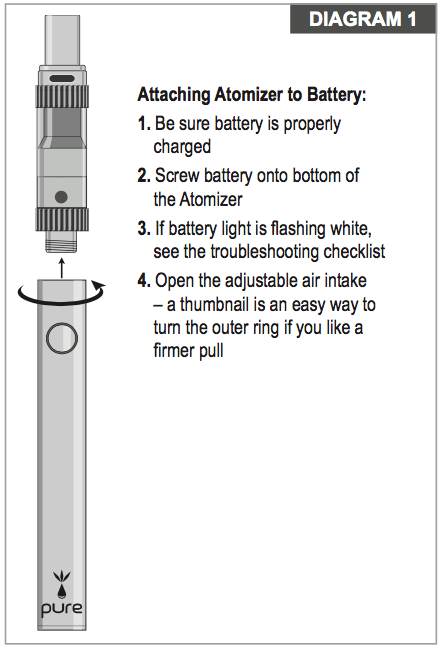 Screw the battery onto the bottom of the Atomizer–that’s the threaded, screw-lined side. How do I smoke from the Atomizer? First, turn the Atomizer on by pressing the button five times. Then press the battery button while inhaling from the mouthpiece for a few seconds. Can I use another battery? Using an HDP battery is highly recommended! Ours provide the optimal temperature for our craft oil. Though other 510 threaded batteries might work, they won’t provide the ideal heat. 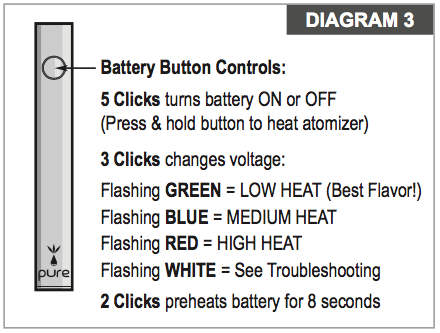 Some non-HDP batteries may burn out the Atomizer’s coil. Air actuated batteries will not work. Should I turn off my battery when I'm done? Good idea, friend-o! We knew you were smart. Turning off the battery when it’s not in use will help conserve charge, protect against overheating, and prevent the Atomizer from clogging. How do I turn the Atomizer off? Press the button five times to turn it on or off. How do I adjust the voltage? Check out this diagram for the low-down. Three button clicks changes the voltage. We recommend pulling a Gatsby and following the green light–green means low heat, and it has the best flavor. Blue is medium heat, and red is high heat. We’re just tickled you asked. All it takes is the USB charger included with your HDP battery. 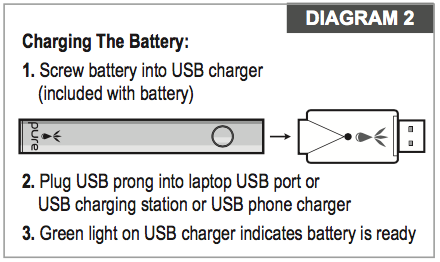 Just screw the USB charger into your battery, then plug it into a USB port (like a computer or phone charger). Once the light on the USB charger turns green, your Atomizer is ready! What if the oil gets too hot or cold? Our oil is happiest outside of extreme temperatures, but we can usually handle the cold! If it gets too hot, it might cause a slight leak or clog. Don’t store your Atomizer in a hot car, near heated surfaces, or in the direct sun for long periods of time. Pockets are a cozy and safe space for HDP Atomizers; they keep the oil at the perfect temperature. Why are my hits weak? There are a few potential culprits! Is your battery low? If so, recharge it. Is the battery voltage too low for your liking? Adjust it. Has your battery been skipping leg day? Encourage its admirable journey to get swole. My Atomizer's just not working. Make sure the battery has a good connection. Try to unscrew it slightly, then screw it back in tightly. If the battery is flashing white, give it a charge. Your atomizer might be clogged. Hold down the power button for a few seconds (just a few!) to warm the clog. If you have a defective Atomizer (non-user failure), give us a shout at info@highdesertpure.com or return it where purchased for a replacement or refund.